Dan Henry, and his wife, Krystal, make their home in the beautiful Bitterroot Valley in Montana. They have two children who are just as mule-crazy as their Daddy. Growing up, Dan's riding skills were grounded in the English world. He was always around and riding sport horses that were of the dressage world. His grandmother, Jill Hassler, and his uncle, Scott Hassler, are both dressage trainers training folks in the Grand Prix. Because of these great influences in his life, he strongly believes in the importance of fine-tuned movements and partnership created between equine and rider. After high school, Dan became partners in Arena Works, Inc., an equine arena footing business that has developed and installs arena footing for high-level dressage and jumping arenas all over the country. 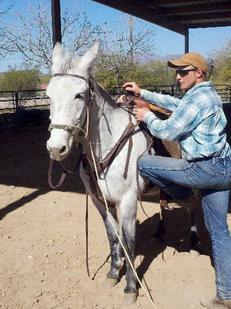 He has had horses all of his life, and then became the proud owner of mules starting in his young adult years. He began his mulemanship while working with the Amish on their farms in Pennsylvania. Since then his knowledge and experience continue to grow. 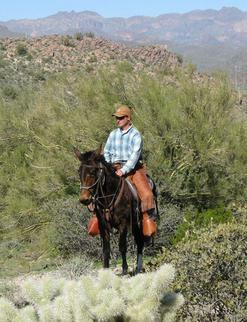 He completed the apprenticeship program with Steve Edwards at the Queen Valley Mule Ranch in Arizona. Currently, Dan is breeding mares/jennys to his mammoth jack, Knute's Centinela Gomez. 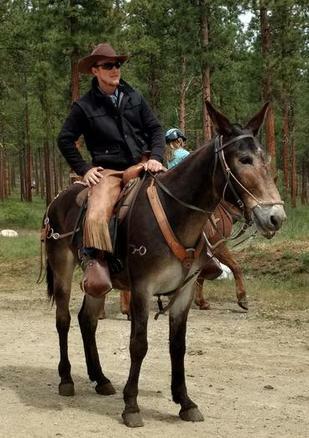 He is also training mules and selling mules. His most important goals are to train great saddle mules and to also help people communicate clearly and correctly with them.